Sojourners envisions a future in which Christians put their faith into action in the passionate pursuit of social justice, peace, and environmental stewardship, working in partnership with people of other perspectives, for the common good of communities, families and individuals. We articulate that vision, convene and mobilize constituencies, and build alliances for effective advocacy. 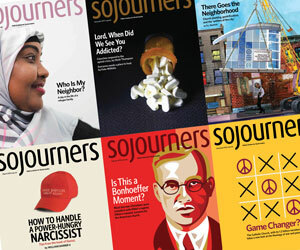 Give a gift articulates the biblical call to social justice and inspires hope: Sojourners. The first one-year gift subscription is $39.95. Two or more gift subscriptions are $31.95 each, a 20% savings off the regular price. Select State Other - Not Listed Alaska Alabama Arkansas Arizona California Colorado Connecticut District of Columbia Delaware Florida Georgia Hawaii Iowa Idaho Illinois Indiana Kansas Kentucky Louisiana Massachusetts Maryland Maine Michigan Minnesota Missouri Mississippi Montana North Carolina North Dakota Nebraska New Hampshire New Jersey New Mexico Nevada New York Ohio Oklahoma Oregon Pennsylvania Rhode Island South Carolina South Dakota Tennessee Texas Utah Virginia Vermont Washington Wisconsin West Virginia Wyoming Armed Forces Americas Armed Forces Europe Armed Forces Pacific AP American Samoa Guam Puerto Rico Virgin Islands Alberta British Columbia Manitoba New Brunswick Newfoundland and Labrador Nova Scotia Northwest Territories Nunavut Ontario Prince Edward Island Quebec Saskatchewan Yukon Please select a state.